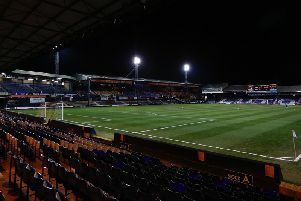 Luton Town youngster Jack James has been called up to the Ireland U19 squad for their UEFA European U19 Championships Elite round qualifiers this week. James, who is currently on loan at Havant & Waterloovilee, has played three times for the U19s before, and is part of Tom Mohan's squad who will face Azerbaijan, Romania, and Russia, with the latter acting as hosts for these three games in Krasnodar. Mohan said: "As a group of players and staff, we are really looking forward to represent our country at the Elite Round in Krasnodar. "This will be our first time to be involved in a UEFA tournament in Russia and our squad are really looking forward to training at the very impressive Krasnodar Academy. "I expect all three games will be very tough against very strong opponents who have all performed really well to qualify from their respective groups. "From our own perspective, we were delighted to have qualified for the Elite Round and we aim to build on the positives from our team's performances in the qualifying round. "This Elite Round tournament will be of great benefit to the development of our players as they will experience playing in high intensity competitive games against quality opponents with all teams competing strongly to top the group and qualify for the finals. "Our players will also experience a different culture which is also very important from an educational point of view and one that we are going to embrace." The matches take place this Wednesday against Romania, then Saturday against Azerbaijan, and next Tuesday against Russia. Goalkeepers: Brian Maher (St Patrick's Athletic), George McMahon (Burnley). Defenders: Andy Lyons (Bohemians), Tom Gaston (Bordeaux), Mark McGuinness (Arsenal), Oisin McEntee (Newcastle United), Jack James (Luton Town), Kameron Ledwidge (Southampton). Midfielders: Niall Morahan (Sligo Rovers), Aaron Bolger (Shamrock Rovers), Jason Knight (Derby County), Luca Connell (Bolton Wanderers), Will Smallbone (Southampton), Conor Grant (Sheffield Wednesday), Richie O'Farrell (UCD).